This pest is one of the most abundant in the United States. In the Pacific Northwest, its range extends north into British Columbia. While typically known for their presence in open areas in an agricultural setting (hence the common name ‘cornfield’), Lasius alienus has been observed causing isolated damage to wood members in Pacific Northwest structures. 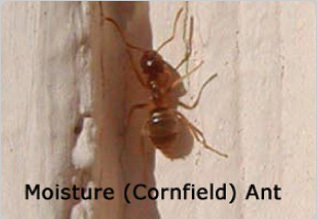 Moisture (cornfield) ants tend to be a secondary structural pest when found in a dwelling. Oftentimes they are found where fungi rot damage is already established. They will nest in moist to near-saturated ground, generally in a subarea crawl space, and build a mud tube-like mastic structure of multiple galleries between the ground and wood. Sometimes their structures are mistaken for subterranean termite tubes. Similar to carpenter ants, moisture ants will bore out fungi rot-damaged wood as well as adjacent wet but sound wood and extend their colony into the area. They can leave behind frass deposits similar to carpenter ants, though it tends to be darker in color due to the higher concentration of rot damaged wood material. Additional academic material on the biology and habits of moisture ants can be read by clicking here. Corrective measures: Moisture problems in the wood structure must be addressed and corrected in a manner similar to that for dampwood termites. 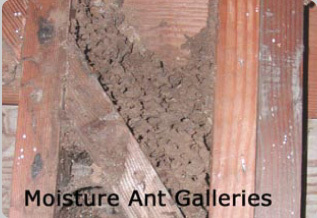 Where infestation continues to exist after such moisture problems are corrected, professional treatment may be required with methods similar to that performed to eradicate carpenter ants. Leupitz Pest Control has had much experience in dealing with these pests and can tailor make a solution to fit your needs. Web site ©2000-2019 Leupitz Pest Control, Inc.